And loyalty. And friendship. And hard work. Ask anyone on the West Coast to name an especially virtuous rider, and there’s a good chance that Lane Clarke will come up in conversation. 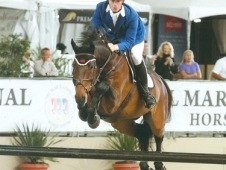 At 27, Clarke is not just an old soul who is well liked on the show jumping circuit. He’s a top-of-the-line show jumper who led the victory parade in multiple grand prix classes this year, most recently in the $55,000 Grand Prix of Del Mar CSI-W (Calif.) on Oct. 27 aboard Casseur de Prix. He’s a tall, blue-eyed Australian who possesses a unique mix of old-fashioned qualities and hot new talent. Sorry ladies, he’s also taken. Clarke and his brother Lyn were born down under, but the family made California their home while they were still toddlers. From the beginning, horses were part of their daily life. The boys’ father, Allen Clarke, is a farrier, natural horsemanship trainer and known “problem horse” fixer in the Southern California area. And his mother Meredith has been a farrier ever since a chauvinistic blacksmith told her sometime in the ‘80s that the day a woman could shoe a horse, was the day that he’d clean a kitchen in an apron. There’s no word on whether he kept up his end of the bet. Growing up in the desert climate of Southern California, both Lane and Lyn inherited their parents’ strong will and feel for horses. They took to riding immediately, with 10-year-old Lane serving as jockey for his father’s horses in training. Lyn would go on to follow in his mother’s footsteps and become a farrier. Lyn has also found a career as a Hollywood stuntman; he served as lead stuntman during filming for The Lone Ranger, due to be released next summer. Working alongside his dad on retraining projects and spending many hours in a round pen served as Lane education on the value of real horsemanship. By the time he was 15, he’d developed a growing interest in show jumping that was reaching the boundaries of what his father could teach him. Around the same time, established California trainer Mickey Hayden heard about the Clarke family from a friend. Coincidentally, Hayden was seated behind Lane and Allen watching a grand prix soon thereafter. After listening to Lane and his father enthusiastically discuss the course, he introduced himself. A subsequent schooling show led to a catch ride for Lane, and soon after the trainer offered him a working student position. Lane describes himself as a “punk kid” at the time, but Hayden was impressed by his work ethic and his family’s unquestioning support of his goals. Hayden’s barn in Laguna Hills was several hours away from the Clarke family farm, so Meredith moved with Lane to the area and began homeschooling him. Three months into his working student duties, Hayden gave Lane a paying job. When Hayden took Lane under his wing, he set about teaching him the finer points of classical training and equitation. Lane took to the new level of riding like a fish to water. By 17, he had won his first grand prix. 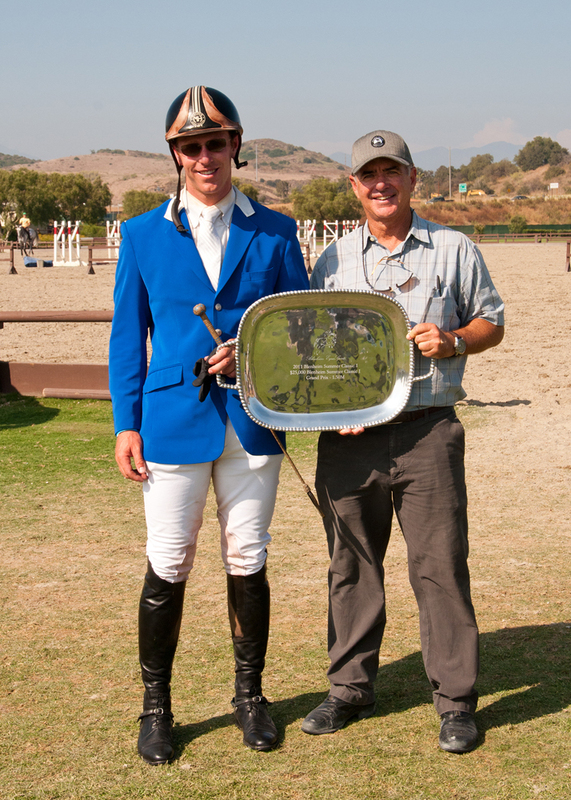 Hayden became a lasting mentor to Lane, and now, 11 years later, the two are partners in a thriving business at Hayden Show Jumping and Riding School in Laguna Hills, Calif. In 2004 Lane was named the Pacific Coast Horseman’s Association Rookie of the Year, and in 2008 he jumped over 7’ in a high jump competition at Del Mar. 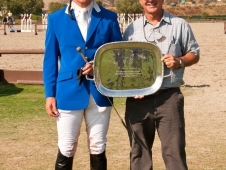 Consistent placings in grand prix classes led to a string of victories in 2011 at the Oaks Blenheim venue in San Juan Capistrano. This past October, he ended his season by winning the World Cup Qualifier grand prix at Del Mar. And over the summer, he asked his long time girlfriend, veterinarian Jennifer Reese, to marry him. Equestrian accomplishments aside, Lane notes that the moment she said “yes” was the high point of his year. The two are planning a wedding in the fall of 2013. Lane’s long-term dreams are the same as most riders; World Cup Finals, Olympic Games, World Equestrian Games. But his training philosophy is decidedly unique, with roots in natural horsemanship and multi-dimensional goals for his horses. To that end, Lane spends time with many of his show jumpers in the round pen, working to enhance and develop his relationship with them. He rides most of them bridleless on occasion, considering the connection needed to successfully ride without tack an essential skill. When it comes time to ask them to jump a fence, understanding how they think and move on their own terms is a necessary part of the foundation. That philosophy carries over to how he coaches riders and is supported by Hayden himself. Lane’s other great influence, his father, continues to be a sounding board and consultant when it comes to ground work and other training techniques. Lane often sends him horses that need extra attention from the ground. Young Rider Charlotte Gadbois, who earned team bronze with Zone 10 at the 2012 North American Young Rider Junior Championships, and finished fourth individually, is an enthusiastic student of Lane’s. Gadbois recently started her grand prix career with Semira de Saulieu, a 10-year-old Belgian Warmblood mare that Lane found for her in Europe. She finished second to her trainer in April in the $25,000 Grand Prix at Flintridge Riding Club in La Canada, Calif., in what was just her third grand prix start ever. In 2013, Lane hopes that she’ll follow in his footsteps and aim for a PCHA Rookie of the Year title. “Lane’s ability to relay his thoughts to his students in a visual way that we understand is incredible,” Gadbois adds. “I look up to him in every aspect. Lane’s two grand prix horses are longtime partners that he has taken the time to get to know thoroughly before aiming them at the big fences. 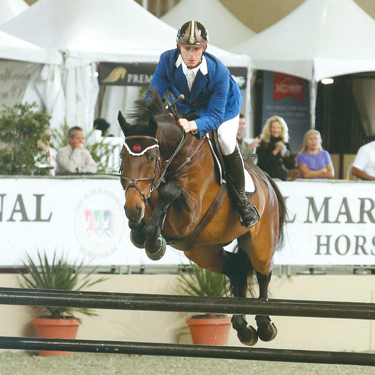 When he won the $55,000 World Cup Qualifier Grand Prix in Del Mar with Casseur de Prix, he ensured that the sensitive, 13-year-old Holsteiner horse felt ready in mind and body before committing to the class. “I try to compete against what is possible, instead of competing against the other riders, and do the best where ever I am,” Lane says. However, with the opportunity to ride at the higher levels of the sport comes the quandary of also balancing a full training program at home. The West Coast shows are strong proving grounds for a rider breaking into World Cup ranks (Lane currently sits eighth on the FEI North American West Coast qualifying list), but he hopes that one day soon, the timing will be right to allow him to compete farther east. Lane only holds one passport, and if those international dreams of his come to fruition, they will happen under the flag of Australia. One of his only drawbacks (at least to American ears) may be that he doesn’t speak with a trace of an Australian accent, but his values are decidedly Aussie.